What’s not to love about southern Florida? We enjoy warm, sunny days and miles of beaches that promote a wonderful way of life. And what better way to enjoy it all than by heading to the water? Hopping on a jet ski and riding the waves can be a great way to get outside and enjoy the sun and the beautiful scenery around Key Largo and down the rest of the keys. But if you’ve never been on a jet ski before, it can be a little daunting. Well, not to worry! 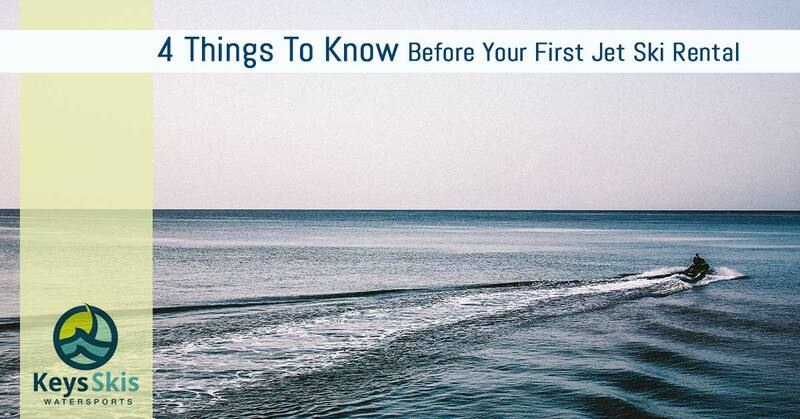 Start with these steps to help make your first jet ski rental experience a success. Movies make it look ultra-glamorous to ride around on a jet ski with nothing but a swimsuit. That’s a good start because, yes, you will get wet. You may want to grab waterproof shoes with a buckle or strap rather than flip flops. You’ll also be out in the sun and whipping over waves. If you plan to wear sunglasses, you’ll probably want those fashionable glasses neck straps to ensure they don’t go flying off into the water. The same goes for a hat. Don’t wear a hat that is too loose, as it may blow off in the wind. They may be dull, but the safety rules your jet ski rental provider runs through aren’t just for liability reasons; they’re there to help you enjoy your time on the water. Pay attention and ask questions as those questions will minimize the risk that something will go wrong. Remember, the rules are there for your safety just as much as other watercrafts’ safety. If you hop on the jet ski and your instincts scream at you to crank the throttle and take off, tell those instincts to go away. If you’ve never been on a jet ski before, it’s better to start slowly and stick near the shore so you can get the hang of operating it before you add higher speeds into the mix. Once you are more comfortable with how to accelerate, brake, and turn, start moving toward deeper water and get comfortable there. Then you can start ramping up your speed. While jet skis aren’t nearly as much at risk as motor boats and other deeper-sitting watercraft, you do still have to be careful about where you choose to explore. Getting stuck in a narrow passage or running into too-shallow water could damage the jet ski and put a serious damper on your excursion. Ask your jet ski rental folks for suggestions if you’re unsure where to start. A bit of planning ahead of time means you can focus on the fun. At Keys Skis and Adventure, we want to help you make the most of your jet ski rental. We’re happy to answer your questions, plan a route, and even send a guide to take you on a jet ski tour of Key Largo. Give us a call to get started!